Create mobile Geo Location strategies for handheld devices. GeoLocation uses IP Location to offer directions based on a users current location. Mobile GeoLocation resides on a mobile landing page. Mobile GeoLocation is a trackable call-to-action. Full analytics are available. 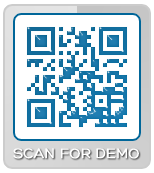 Scan the code to get directions to the Santa Monica Pier - based on your current location.